One of the alarm standards uses DTMF tones really fast, and the conversion from inband to out of band and back at the other end screws it up, as you get little bits of the inband tone get thru, and this causes doubleups. If DTMF is not taken out of band by the ATA, it is usually quite reliable so long as the call quality is good. Out of band really came about because all the horrible lossy codecs cant pass DTMF in band, and also the echo cancelling will munge it as far as trying to interupt annoying IVR's, whereas out of band will bypass the echo cancelling and compression and come thru cleanly. my bro in law whos an alarm tech said the system over sparks VoF could possibly be hit and miss because it all depends on the codec and encoding/decoding times, and all it would take is a ms worth of delay and it can screw up a signal, so i would say you best bet would be to get an alarm server so you can use your alarm over IP. couple of hundred bucks to connect it via IP (if your monitoring company supports it) then some money for a UPS and you should be good to go. Interesting comments, the alarm company guy I spoke with (who was an actual technical person it seemed) was very certain it would not work anywhere near well enough over VoIP, and the salesperson readily gave me their IP options as if she had done it many times before. If I was really interested I guess I could try get another alarm company to come and give a quote/opinion for free, but I'm not that motivated. I agree that $200 or so for an IP module isn't very much for those of us who understand the difference UFB can make and don't won't to pay a $40 a month premium (yes, it's now $150 for 100/20 + POTS landline as you have to buy two plans, and I assume other ISPs are similar). When I asked, the salesperson said that as part of their installation they would power the ONT and router off the alarm (or use the mobile network for a slightly higher cost) avoiding the need for a separate UPS - I guess that makes up for the $160 they wanted to charge for installation. it could work well, if both spark and the alarm use the same codecs etc but then again they might not, as there is no set standard for Voip or VoF. its a shame but it is what it is, i would just go for the IP solution if it were me. 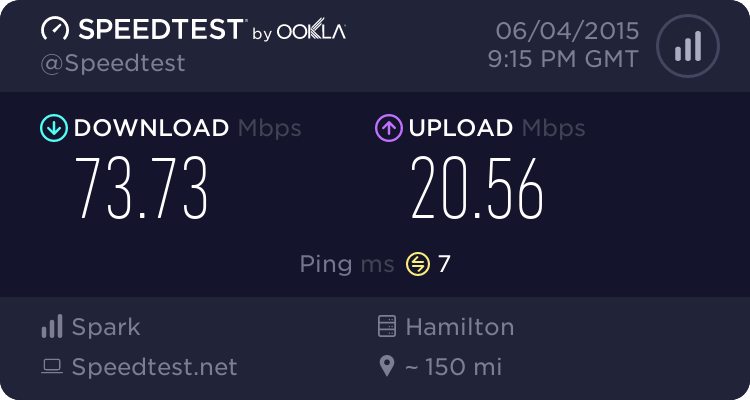 GregV: Moving from Fibre30 to Fibre100+LL, and it has been a slow process. I understand that there were new things for the CSRs to learn, but my order placed over the phone on the 5th - launch day - was actually cancelled with no notification to me. It was only when I contacted Spark to see how the plan change was going that I was told about the cancellation. Resubmitted on Tuesday, and I now have a reference number, so fingers crossed. How long should it take to do the plan change, and VoIP cutover (no wiring visit required)? Ok - so I now have two Gigabit Router/Modems... and Two DECT Phones.. sigh..
Yeah... internet / fibre went down yesterday , got a call from Spark this morning - I needed to get the Serial no from the ONT in order for Chorus to make the change... got a call back 20 mins later on the DECT phone plugged into the ONT ! Yeah !! The lady who answers the phones at our alarm company (Wanganui Security, recently bought by Electra) tell me that using voice over fibre for our alarm is absolutely fine, and is what she uses at her house. Our alarm is some random brand and therefore probably ContactID. It worked absolutely fine over the ATA in the Orcon Genius we had, and absolutely fine over the ATA in the ONT now that we're with MyRepublic. If you get VoFr can you then take your number to another fibre connection in the same city (enable). We have to move for repairs and Spark say that we cant move the number. I understand you cant when its on copper as its on the old platform, but if its voip then surely you can take it with you from one fibre connection to another in the same city? The person at Spark I spoke to said I would need a new number we want to keep the number as we will only be out for 6 months then will move back in and we have had the number fo a long time. Is this correct about having to get a new number? If they wont let you take it with, then just port it to 2talk. Moving back to a telco is optional when you return to your house. GregV: Yeah - definitely some teething issues. Took me much longer than expected, but I now have internet and phone coming off the fibre. As soon as I could authenticate with and complete the Downer online form, things happened as and when they should (there was still an issue with the cordless phone offer, but that was resolved by cbrpilot on here). Plan changed, and voice was cutover on the day/time agreed. I'll give it another go moving parents over to FibreLL solely using the online process. Hopefully it is smooth sailing. Just tried to move parents over to FibreLL (they currently have Fibre30 with copper LL). Like me, they plan to connect a phone directly to the ONT, and not use any copper. Once again, the Downer form does not match the work required. Their UFB install was requested just before Spark announced FibreLL, so Chorus did not do the copper wiring install when the fibre went in. The tech enquired about it on install day, but received confirmation from Chorus that it was UFB only, with no phone wiring to occur. 2. They do have the box on the wall (they don't), which allows them to select a cutover date with no tech visit required. Dad didn't want to do this, in case it causes problems later with Spark/Chorus thinking equipment is in place when it is not. Neither option mentioned the magical free cordless phone, unless it was after the very final acceptance, which we didn't want to accept without getting an answer to the issue above. I had the same issue with my FibreLL, and it took manual intervention by cbrpilot here to get the phone to me. I was in same position, form worked fine, dect phone arrived as did HUAWEI gigabit modem and no technician turned up..
1. Do I insert the phone in POTS1 or POTS2 on the ONT? 2. Will this phone work? Ignore my previous message - phone line came to life. tdgeek:Next to the ONT is a white box, these have been installed in recent months prior to Spark's VoF capability. It is an ATA termination. Why does it need a seperate ATA? Doesn't the ONT itself effectively have a 2 port ATA built in? It is more a wiring hookup into the legacy copper house wiring, allowing all existing jackpoints to connect to the POTS1 port on the ONT. Not needed if you plan to plug your phone directly into the ONT. The Downer upgrade form doesn't take this into account for any UFB installs done prior, insisting on sending a technician if you don't have one of these. It's a 2 port RJ45 junction box. It wired so the existing jack points connect to one port, and incoming copper to the other. Over the last few months this has been left with a jumper cable running between the two, but for a customer to move to ONT VoIP they simply need to connect a cable from the ONT voice port to the RJ45 socket to cut all their home wiring across to the ONT VoIP service.